This may not be the most beautiful juice to look at, but the taste is magnificent, and it is oh so good for you, so give it a try! 1. Peel the orange, leaving the pith on, and break or chop it into sections that will fit through the juicer shute. 2. Top and tail the carrots and chop any that are particularly large. If you like, cut a couple of carrot sticks to use as stirrers or as a garnish for the drink. 3. Give the kale leaves a good rinse in a colander, then tip them into a clean dish towel and pat them dry. 4. 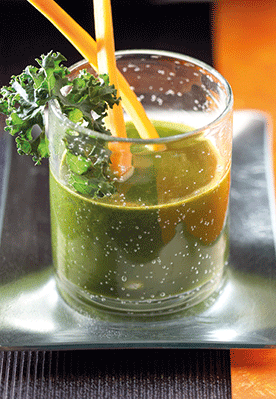 Put the carrots through the juicer with the oranges and the kale leaves – keeping back a leaf to dress the drink. 5. Give it a stir to combine all the flavours, then pour into a glass and garnish with the carrot sticks, if using, and the reserved kale leaf. Nutrients: Beta-carotene, folic acid, vitamins B3 and C, calcium, iron, magnesium, manganese, phosphorus, potassium, sodium and sulphur. Recipe taken from I Love My Juicer: Over 100 Fast, Fresh Juices and Smoothies, by Natalie Savona. Nourish Books, 2018. Paperback, £12.99. Commissioned photography by William Lingwood.